Feminism is a word that came into existence very recently. Better late than never, one would say. But has one thought how it would have been had feminism existed right from day one? If men and women enjoyed equal rights right from the evolution of time, would there ever be a need for the very word? Today, feminism is considered a bad word. Most people don't know what it is and a lot of wrong and unnecessary things are also being done in the name of feminism. There is no denying that. Feminism is about having equal rights for men and women. It is not male bashing. It is not the elevation of the female on a pedestal. It is not about celebrating women's day. Feminism is not about all the million things that it is deemed about. It is only about one thing. Gender Equality. Still, most of us do not get this. There are quite a lot of women who call themselves "feminists" just to appear cool. These are the same women who succumb to husbands at home and think that as women they should not be expected to be a part of decision making as that's a man's job. Hypocrisy, anyone? 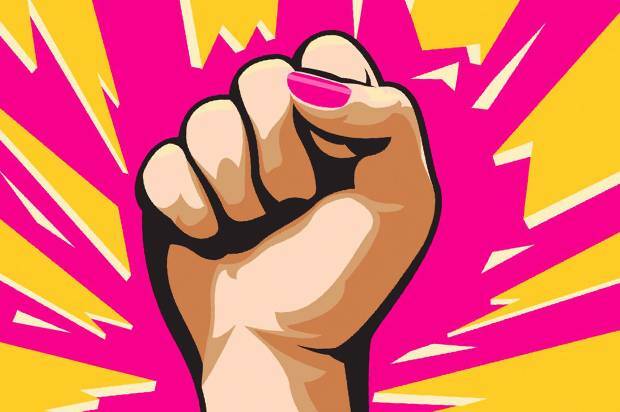 Even after so many marches, so many articles, so many speeches, so many Facebook updates why don't we still get the underlying meaning of feminism? We need to start at the very beginning for that. Growing up in the 90s, the concept of feminism never existed. Obviously. But one thing did exist but none of us were aware about - Male Chauvinism. My father was a typical male chauvinist and my mother was completely okay with that. She was a working lady as well. But she was the only one who was expected to handle the household chores, shopping, bills etc. As the man, his only job was to bring in the moolah. Everything else was expected to be taken care of by my mom. She too was bringing in the same amount of money, but that was never taken into account. He wanted food to be served on his plate without asking. He would tap the plate if he needed something and in case my mother missed to notice this, he would just walk off the table. I have seen uncles call their wives by clapping their hands or by tapping their fingers and have seen their wives come running. Since it happened in every household, I thought it was normal. How could one know about feminism then, let alone understand it? It is now easy to go back and think as to why these women did not raise their voices against this? I also think why did I not question my dad back then? Since the women did not complain, I did not see anything out of the ordinary. Most women honestly thought that it was their duty to serve their husbands and their sons. The question of inequality never arose as this was considered the law of nature. Recently, I heard about a family friend's daughter getting married. She's a very pretty, educated girl with a good job in hand. Turns out, most of the proposals that came her way were asking for a well educated girl who would not have to work after marriage. Reason? A working woman would not be able to take care of the house well. While I was getting married, a lot of questions did the rounds. Why does one need an educated girl to take care of the house? My MIL was not very happy with me as I was not the one who was very interested in the household chores. I was a working lady and she, a housewife. She was totally fine with doing all the chores at home, because she was a woman. Until I came along. Then, I was expected to take over her rusty baton and take care of the house while handling a job while she was full time present at home. No sir! Just because you are fine with something, doesn't mean I have to be too. All these expectations and all these reasons were normal to them. Well, it was time they got a reality check. My husband is a sweetheart and he was very particular about me not having to give up on my dreams and aspirations. He did not want me to change in to a house wife and take care of everything around the house. He wanted us to do it together. Together, we walked halfway and things got done. That is when the concept of feminism dawned upon me. Why can't more men stand up for their wives? Why can't they understand that a woman is also a human being and she deserves to be treated the same way as men? Why can't more men help the women around the house. Why can't men and women be treated as equal beings? As much as men need to understand this, women need to understand this more. Trust me, it is not okay to accept yourself as the second fiddle. I find it hard to believe when some women say that they are not feminists. How can a woman not want the same privileges as that of a man? As a woman, you need to be a born feminist. It's only natural. It is because of practices like the ones that I've mentioned above that feminism is considered a bad word today. One needs to wake up, smell the coffee and realize that just because something has been going on for ages, it doesn't mean that it is right. Just because most women don't complain and do it as their duty, doesn't mean you have to too. Just because men are raised as bread winners and women as care takers, doesn't mean that you have to adhere to the norm. You can be a caretaker and much much more. Yes, feminism didn't exist back then, but now it does. Are you doing something about it? This post is a part of the powerful series #FeministMondays on Naba's blog. Since this is my first post, I started from the basics. Going forward, on the second Monday of every month there would be a post on feminism. You can be a part of it too. Write an impactful post with the hashtag #FeministMondays and link it back to Naba's blog. We might be a small voice now, but together we can make it powerful. No matter what one says, although things are changing now, we are very very far away from gender equality. As women, let's come together and expedite this process. I loved this post. For one thing, I completely agree with you on the meaning and interpretation of Feminism.Never mind that social media has completely blown things out of proportion and people are going hammer and tongs at each other over this term. Equality. It's as simple as that. I am proud to be married to a man who believes in equal responsibility. He cooks, cleans, stitches, takes care of Gy just because he can. Nothing major about it. I work because I enjoy it not because I must and I couldn't do it if I was expected to do everything under the sun in addition to working too. I am keen on writing something on this series. Let's see if I can get a post out next Monday. Thank you so much Shy! I have seen how awesome your husband is on Insta :). You definitely must be proud of him. Looking forward to you post soon. Exactly, right? Ah don't get me started on the respect and age bit! Respect comes with deeds, not age! Gosh, will they ever understand. I am with you on this, Soumya. I am a feminist and proud to be one. After all why would I want to be lesser than any one else. My mum was a housewife but she was the queen at home. Dad and mum were very equal in decision making. She handled the home, he brought the money home. And there was immense respect and love for each other. My siblings and I were brought up to be independent, working women. I have a partner who does so much at home and is a very hands-on dad. He was brought up by a working woman after all. I do agree that many women just consider being treated as second rung normal because this is the normal that they have been exposed to and then they raise their sons to carry the tradition forward. Let's hope that drop by drop can change perceptions. Oh you are so lucky to have been surrounded by such strong women. Let's hope that women realize their true value soon and imbibe the same in their sons and daughters as well. I agree completely and wholeheartedly agree, Soumya. I read in Lean In, I think, about the maternal gatekeeper behaviour that we exhibit. We don't let men do anything at home that is also a problem. It starts in a single house, every single house and becomes a norm in society. That's why it is so important that women of our generation make the changes at home. I'm so happy that you decided to join this small yet very important endeavour, every bit counts. Let's hope we are able to bring some change, maybe in the life of one woman but still. Yes, women need to stand up and make the changes and not just succumb to age old traditions and norm. Thank you, Naba. Let's hope more women join in and spark a change. I don't understand feminism very well. I love it when we behave equally because that is how it should be, but lately I have seen so many women taking advantage of this hence making me confused about the whole aspect. I have friends who earn but do not contribute to the household. Instead, they 'save' everything. Women who are housewives hire full-time help and spend their time socialising and shopping saying that these chores are lowly and their education doesn't allow them to do the same. The Boy has gone out for dinner with his colleagues right now, but the women will not pay. Why? They are trying to be gentlemanly about it, but shouldn't these women insist!? I feel that these are the same women who live with the best men in our society to whom feminism come naturally. These men should be rewarded (just for example, not because they are doing something extraordinary!) and not taken undue advantage of. Feminism should talk about this as much. I actually have seen these type of women, Nisha, and they sickening me. I know of a lady who was boasting that her husband does two jobs while she splurges on clothes, jewellery, gym etc. No one speaks up for such women. I know of girls who throw the victim card at में when they come from privileged backgrounds. It is happening sadly. The type of women you both have mentioned are the reason why I loathe a certain breed of housewives. It is sad that some women accept that the men should take care of them and call this feminism as well. Feminism should also be about how women should not take advantage of the gentlemen. Actually, this is what I have planned for my next post on this topic. Maybe you both should write about it too. And I thought I wasn't a feminist... because I thought feminist meant wanting to be a working woman. No, not necessarily! If feminism means equal rights, then Absolutely! I am equal in every way to my husband. We work together to create a dynamic that works for us as a partnership. For us, that means he earns the income and I manage the household, but he's under no delusion that we couldn't switch places. We could! We have actively chosen not to. It's funny, he sometimes does things that look chauvinistic from the outside. But what he's actually doing is letting me know, "this is how you can show me love in this moment." How do I know this? Because we sat down and talked about it, privately but openly. As with all things, my spouse and I communicate what we need from the relationship as well as what we are willing to give. That's how a woman can be treated equal in a marriage. Equals in a marriage is always the key. What a powerful post Soumya. We were brought up by a feminist mom. She might not have thought of labelling herself a feminist but she sure is one and so when I grew up and saw women laying out their husband's clothes in the morning and running after them with their wallet and keys I thought it was just a filmy thing. I was shocked to realise it actually happened in real life. My husband had a more traditional upbringing but mercifully he doesn't want me to handle all the housework - he's one for outsourcing and I'm mostly okay with that. Glad you took this up and looking forward to more of your posts. Ah those kind. I know of so many women who run after their sons/husbands with handkerchiefs and keys. Annoys me to the bone. Filmy yes, yet very realistic and prevalent. Well, let's hope it does change somewhere down the line. If there is one set of people who need to know about feminism more, it has to be MILs. That's a fabulously honest post and you know I couldn't agree more. The image that you shared is so so powerful. And isn't it such a reality? While I totally agree that every woman should be a feminist, the challenge is women accept things for themselves and their daughters. They think that's what their life and fate is. They don't speak up for themselves and that not fair. I'll also join this tag Soumya! Women need to understand feminism better and imbibe the same in their children. Women need not accept that they always come behind a man. No sir, no! Simple yet powerful ! Yes a lot of women say ' Oh we are not feminists '. AS if F word is a tabboo. Everybody should be feminist, even men.